I was about ten or eleven-years-old when I read my first book by Damon Runyon. It was called Johnny One-Eye. I’ve only just learned that it was a short-story first published in Colliers Magazine in 1941. 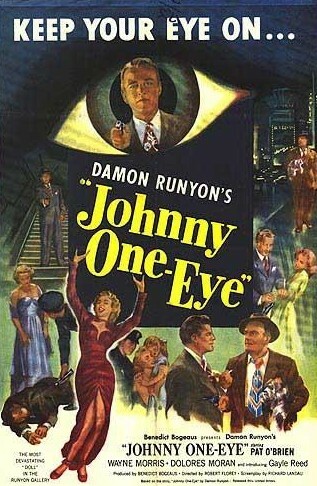 The book that I read in the late Forties, titled Johnny One-Eye, was a one-inch thick hard-cover in black rexine, and I have always thought it was complete novel. However, the facts being the facts, it must have been a compilation of Runyon’s work. Normally, at that time of my life, I rarely read books. I blame my school for that: stuffing young kids’ heads full of Shakespeare, George Eliot, and the Brontës. Whenever I tried a book, I put it aside after a few boring chapters, thinking that I just didn’t like books (rather than comics and magazines). I was yet to realise that, simply, I hadn’t yet read anything of personal interest to me written in everyday language that I could understand. Johnny One-Eye, I remember, had sat on my bedroom mantelpiece over the fireplace for many months. It was my mother’s book, taken out from Boots the Chemists Lending Library at probably sixpence (5c) per week. Obviously, being above such things, my mother never bothered to return it. Again, I seem to remember, I may have had a dose of the ‘flu at the time, enough to keep me in bed for a day or two, and it was then most likely that I reached for the book and read it – and thoroughly enjoyed it. I can honestly say that it was Johnny One-Eye, and later, Tomboy, a junk paperback about New York City street gangs (then controversial but of some note as a ‘first’ today), that my older sister had just finished, which set me to reading to the extent that reading is something I’m almost addicted to today. I became a dedicated reader as a young teenager. 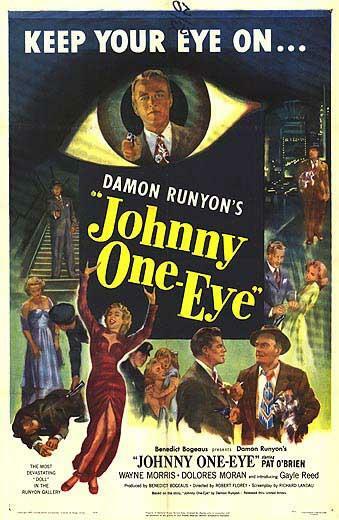 Last week, on researching Johnny One-Eye, I found that more than a few of its present day book reviewers are disseminating an error in describing its plot. They state that Johnny One-Eye was a dog, when in fact it (he) was a kitten. 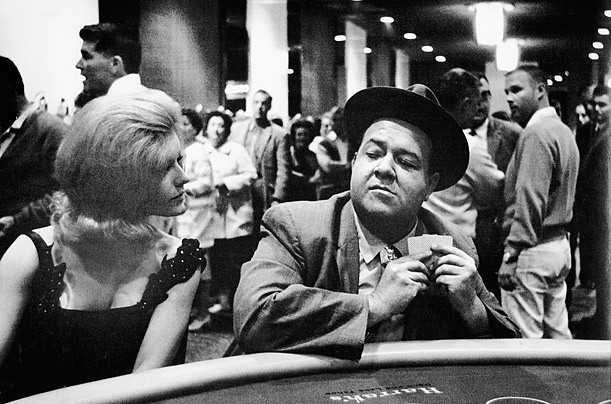 They have mistakenly taken as their source the eponymous 1950 Pat O’Brien film, whose producers made the change from cat to dog for reasons known only to them and Damon Runyon, who was duly screen-credited for Story. So, I actually knew Harry the Horse, Benny the Blond Jew, Nicely-Nicely Johnson, the Lemon Drop Kid, et al, long before I introduced myself to Runyon. Why I loved Runyon on my first reading was much more about his language, his scrupulous use of the present tense, and his characters rather than his plots. In fact I didn’t care for his ‘normally’ written work about non-Broadway subjects much at all. But I’m sure that if I read them now, as an adult, I’d like them; probably very much. Sadly, I learned not too long ago that Runyon was a noted anti-Semite. I’m sure that was a hard thing to be in a Jewish town like New York peopled by characters he wrote about that were almost certainly and mainly Jewish. How could they not be? Never mind all that, I love Runyon and his Broadway, and like The Pat Hobby Stories, I go back to them again and again when I feel enough time has passed for me to enjoy them anew. So, to answer your question: with Runyon (and Pat Hobby) I have no favourites. The whole of them, taken together, is my favourite, just like my kids. PS: A poignant little story about my pre-teen reading. When I was about nine-years-old I somehow came into possession of a Bugs Bunny comic. This was rare because in the immediate post-war period Britain was pretty much bankrupt and anything imported was severely restricted to the necessities. Every dollar was needed to pay our huge war-debt to the United States. I loved Warner Bros. cartoons because they were the very best, and because they had Mel Blanc. At the end of the Bugs Bunny comic was a little ad offering a year’s subscription for a dollar (if I remember right). Now, it happens I actually had a US dollar coin that a very kind Canadian serviceman lodging in one of our flats had given me. So I cut out the ad, filled in my address, dropped in the dollar coin and posted it off to an address in Poughkeepsie (I’ve never forgotten the name). 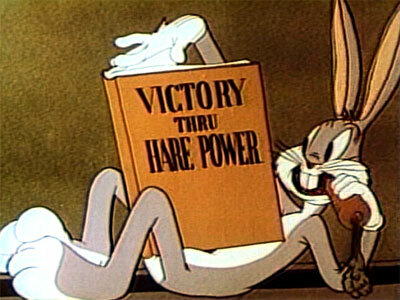 Sure enough, weeks later, a copy of Bugs Bunny dropped through our letter-box and continued doing so for one year. Only as an adult did I realise what a very kind gesture this was. The air mail costs must have eaten up any profit to the publishers after just a couple of weeks. I find that very, very touching, and now you know why I love America.